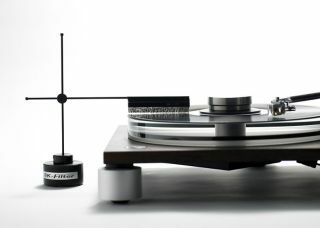 Furutech’s SK-Filter removes static to make your vinyl sound better | What Hi-Fi? The SK-Filter is the latest addition to Furutech’s range of static charge eliminators and promises to discharge any static electricity generated by your records to improve sound quality. If you’re an avid vinyl enthusiast you’re probably aware that as your records spin they generate a static charge, which affects sound quality. There are a few methods of getting rid of it, such as an anti-static gun or certain microfibre cloths, but Japanese audio brand Furutech believes its new product is the ideal solution. The SK-Filter claims to remove unwanted static charge while the record is playing. It uses a patented material called Thunderon, which sees a very fine acrylic fibre chemically bonded with copper sulphide. Furutech says the resulting conductive filament can discharge static electricity in the air whenever it comes into contact with it. The SK-Filter doesn’t need to touch the record to work, it sits a couple of millimetres above the record surface and is supported by an adjustable stand. The Furutech SK-Filter is available now for £350.